“Fantastic Beasts: The Crimes of Grindelwald” gets political while continuing to drift away from the Harry Potter series, possibly to leave an adolescent past behind. The film opened up strong with an impressive ambition to tap into the current political climate. It seems that even when you go to the movies to escape, you cannot escape the “news.” Even in a fantasy film that should be a safe haven. One that many have grown up with to escape into a fantasy world that is none like ours. With this film, that is not possible. The film’s script was written by J.K. Rowling herself, who was also the story’s creator. In the “Crimes of Grindelwald” Rowling decides to step into the political arena with a big-haired blond, Grindelwald (Johnny Depp), who wants to divide the world between those with magic and those without. The film all too obviously presents a character much like President Trump. Grindelwald wants dominion over the muggles (called no-majs in this franchise), the non magical humans. The story continues with the lead character, Newt Scamander (Eddie Redmayne) who only wants to take care of his fantastic beasts, but gets dragged into a maze of mystery. It is up to Scamander to save the day from Grindelwald and his goons; much like it was up to Harry Potter to save Hogwarts, and the world from Voldemort and his Death Eaters. In the second installment of this prequel, Imagine a world if Harry Potter was all grown up, and he happens to be a nerd, or more of one. Harry Potter is all grown up and finally graduates from Hogwarts. He goes off and finds a career as a magizoologist (one who studies magical creatures). Everything revolves around Scamander in this grown up version of JK Rowling’s world. Dumbledore is even in the film, with a suit and tie. This is the world of Fantastic Beasts. The film was gracefully directed by David Yates, who directed “Fantastic Beast and Where to Find Them,” as well as the last four Harry Potter films. He returned to direct this latest installment. The film had an impressive cast that includes, Redmayne, Depp, Katherine Waterson, and Jude Law. 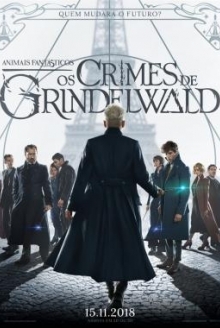 “The Crimes of Grindelwald” was an entertaining film that takes you on a magical voyage into adulthood. If you were a kid when you first read, or watched Harry Potter, and no longer feel it hits the spot, then give Fantastic Beasts: The Crimes of Grindelwald a chance. J.K. Rowling didn’t forget about you even as an adult–she even considered that you watch the news.